In response to the disproportionate influence of the well-off that I document in Affluence & Influence some have argued that policy reflects (and perhaps should reflect) the preferences of the affluent because affluent Americans are better informed, or because they care more, or because they are more likely to engage politically by voting, contacting their representatives, or working on political campaigns. None of these explanations can account for much of the representational inequality I found. Faith in the wisdom of the affluent to guide public policy has been sorely tested by the enormous costs in money and human suffering resulting from the Great Recession. (Affluent Americans have been more enthusiastic about deregulation in general, and of the financial industry in particular, than the less well-off.) My data cast further doubt on the notion that representational inequality arises from the greater knowledge or better judgment of those with higher incomes. If government responds not simply to the most affluent but to the most knowledgeable citizens, we would expect education to be a stronger moderator of the preference/policy link than income. In fact, I find the opposite: when both are taken into account, income is a far stronger determinant of influence over policy outcomes than is education (see below). As far as caring about policy outcomes is concerned, there is no evidence that I’m aware of that suggests that middle-class or poor Americans care less about policy outcomes than the well-off. 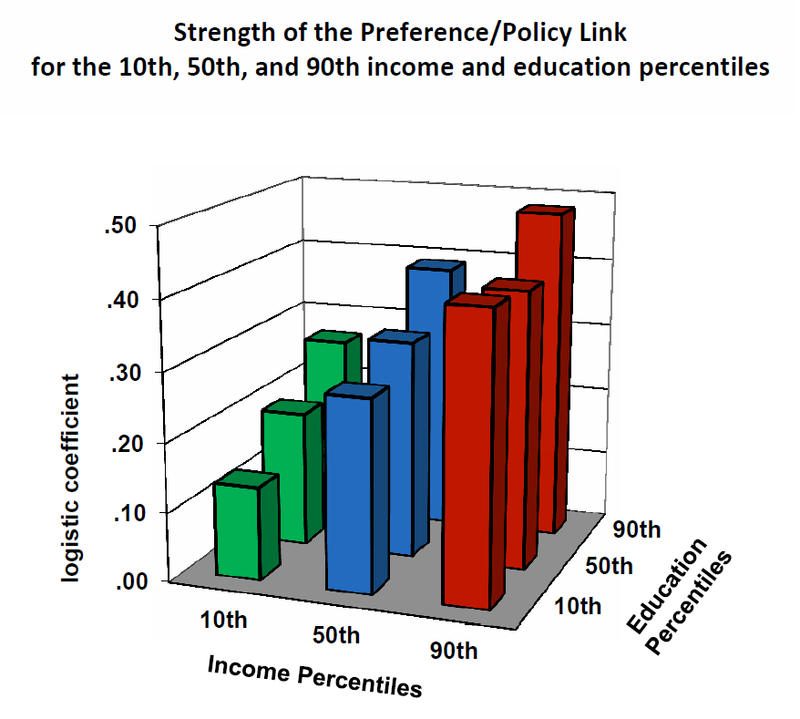 When the 2004 ANES asked “How important is this issue to you personally?” with regard to half a dozen prominent policy issues, there were no differences across income levels. Similarly, my own data show no difference in the proportion of respondents at different income levels expressing “strong” versus “somewhat” favorable or unfavorable views toward proposed policy changes. Poor people do vote at lower rates than middle-income or affluent Americans, and other forms of individual political engagement, like working on campaigns and contacting elected officials, also vary by income level. But Larry Bartels’ analyses of Senators’ voting patterns and the preferences of their low, middle, and high income constituents shows that little of the representational inequality he documents can be accounted for by class differences in turnout, political knowledge, or contacting elected officials (see Larry’s masterful book Unequal Democracy). Moreover, the relationship between income and political engagement does not parallel the relationship between income and influence over policymaking. As the charts below indicate, it is the poor who are distinctively low in voting and campaign work, but as my first post showed, it is high income Americans who are distinctive in their ability to shape government policy. Electoral campaigns are extraordinarily expensive, and they have become considerably more so over time. The “professionalization” of political campaigns, with their increased focus on paid advertising and sophisticated targeting operations, has increased the value of money relative to other resources (like the ability to mobilize large numbers of volunteers). The growing need for campaign cash has combined with a growing economic inequality that has concentrated more of the country’s wealth in the hands of fewer of its citizens. Together these developments threaten to produce a vicious cycle in which affluent Americans shape policy in ways that enhance their existing advantages and further their ability to determine the course of government policymaking. Can anything be done to make policymakers more equally responsive to the preferences of all Americans? 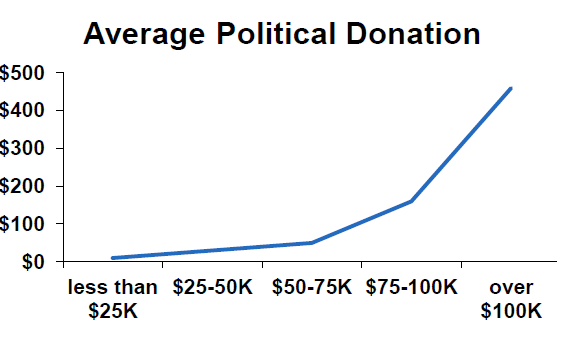 Campaign finance reforms that reduce the role of large donors are one avenue to pursue. The current climate does not seem auspicious, but Citizens United was a five-to-four decision and perhaps a future Court will be friendlier to campaign finance reform efforts. In addition, competition-enhancing reforms like non-partisan districting might produce more competitive elections and induce policymakers to attend more closely to the public’s preferences. Finally, advocates can focus on those policies that are supported by the affluent and poor alike. Majorities of affluent Americans support increases in the minimum wage, spending for education, job training programs, Social Security, and Medicare (albeit with somewhat less enthusiasm than the less well-off). Reducing representational inequality will not be easy. But the stakes are so high in this era of enormous social and economic challenges that we cannot be content with a government by the few and for the few, especially when those few are distinguished solely by the size of their bank accounts. A non-technical description of this project (with responses from 10 commentators) is in The Boston Review, some early findings and technical details are in Public Opinion Quarterly, and much more (including discussions of the quality of mass opinion, the role of interest groups, the difference between Democratic and Republican party control, and elite manipulation of public preferences) can be found in Affluence & Influence: Economic Inequality and Political Power in America. In my previous post I discussed the lack of government responsiveness to the middle-class and the poor, when their policy preferences diverge from those of the affluent. This inequality is pervasive: I found no circumstances during the decades I examined in which the middle-class had as much influence as the well-off, or the poor as much influence as the middle-class. Although pervasive, representational inequality does fluctuate. 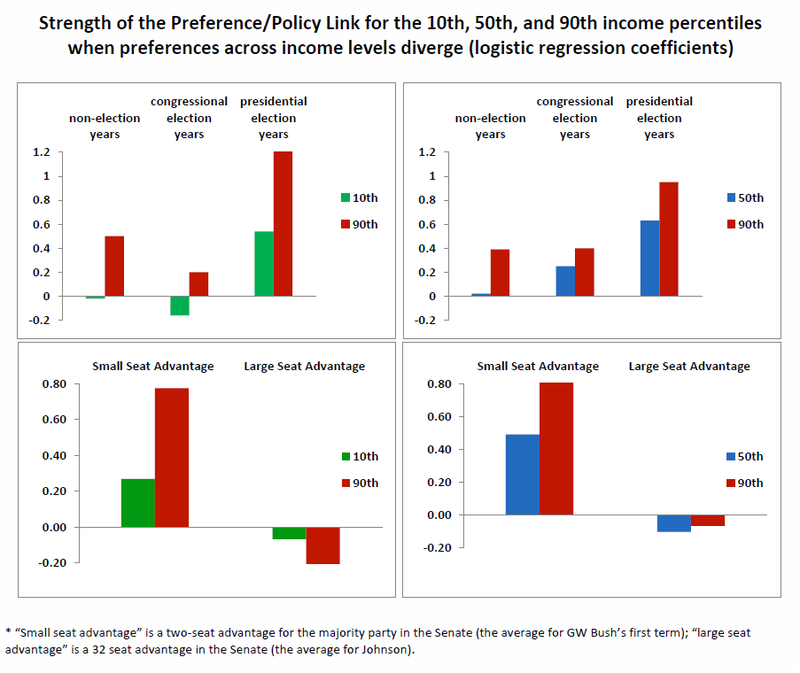 When the balance of power between the two major parties is close and when presidential elections loom, policy corresponds more closely to the preferences of the public, and more equally to the preferences of the more- and less-advantaged. The hopeful side of this observation is that democratic institutions do work, to an extent, to discipline policymakers and bring policy outcomes more in line with the public’s desires. But these periods of heightened responsiveness are the exception, not the rule, and it appears that policies “forced” on decision makers by political circumstances fare less well over time than those adopted under less “coercive” conditions. Although policies adopted during presidential election years are more consistent with public preferences, they are also more likely to lose funding over time than are policies adopted in other years of the quadrennial election cycle (thanks to Will Howell for supplying these data on funding levels). The power of partisan competition to produce policy that is more consistent with public preferences leads to some unexpected patterns. For example, the strong Democratic party dominance of the Johnson years did not result in policies that were, on the whole, consistent with the preferences of any income group. True, some of the central and vitally important components of the Great Society, such as Medicare and federal aid to education, were extremely popular among lower income Americans and only modestly less so among the affluent. But Americans strongly opposed other domestic policies including much of the war on poverty, immigration reform, and the Vietnam war tax surcharge (not to mention the declining support for the administrations’ escalation of the war itself). In contrast, the close election in 2000 and the even partisan division in congress during the first years of GW Bush’s administration brought policymaking that was unusually consistent with public preferences. The Medicare drug benefit, the No Child Left Behind education reforms, Bush’s “faith based initiative,” and the income and estate tax reductions were all quite popular among low and high income Americans alike, as were the early years of the Afghan and Iraq wars. 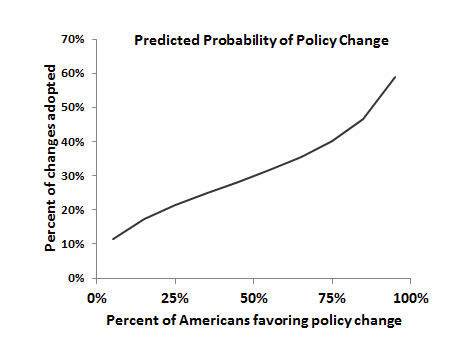 Public support for some of these policies may have rested on misinformation (e.g., the Iraq war) or poor judgment, but as I argue in Affluence & Influence, Americans were not, for the most part, duped into wildly inaccurate beliefs about these policies. Early Bush administration policies fit well with public preferences, but when the Republicans gained unified control of the federal government in 2004 (for the first time in more than 50 years) policy responsiveness to the public plummeted. Neither affluent nor poor Americans had any more influence over policy outcomes during 2005 and 2006 than they did during the period of dominant Democratic control in the mid-1960s. This pattern of policy responsiveness fits well with the view of political parties as policy maximizers (e.g., Cohen, et al.). Both parties, when they have the ability, cater to their core constituencies and key interest groups, essentially ignoring the preferences of the public. But when political conditions threaten too high a price for pursuing unpopular polices, the parties cleave more closely to the preferences of the public and more equally to the preferences of lower as well as higher income Americans. 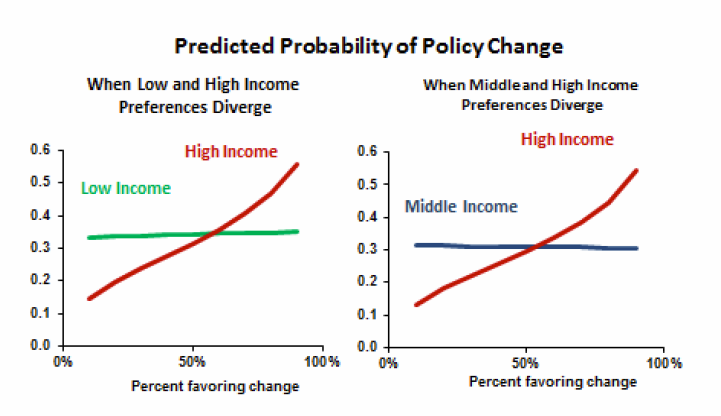 In my final post tomorrow I’ll write about why government policy disproportionately reflects the preferences of the affluent and what might be done to increase the responsiveness of policymakers to the preferences of all Americans.